I really could have called these meatless meatballs three ingredient meatless meatballs because that’s all they really need in their most basic form, aside from spices of course but who counts the spices? So what’s the three ingredients you wonder? Cannellini beans (also known as white beans), nutritional yeast and some tomato paste. It’s a new recipe I conjured up too. When I planned our dinners for the week and my son selected meatballs for Sunday night, I figured I would take some time in the kitchen to not only make his meatballs, but remake my old meatless meatball recipe since it had been forever since I had them. Of course once I got into the kitchen, I had zero interest in looking up what my old recipe was mostly because I hate following recipes, even when the recipes are my own. Instead, I made up a new meatless meatball recipe and I am really excited about it because it’s so easy and really good! Grain-free and dairy-free, there’s also no processed soy which is often seen in the meatless (and chickenless) products you get at the grocery store. I used to love those meatless meatballs from Trader Joe’s. 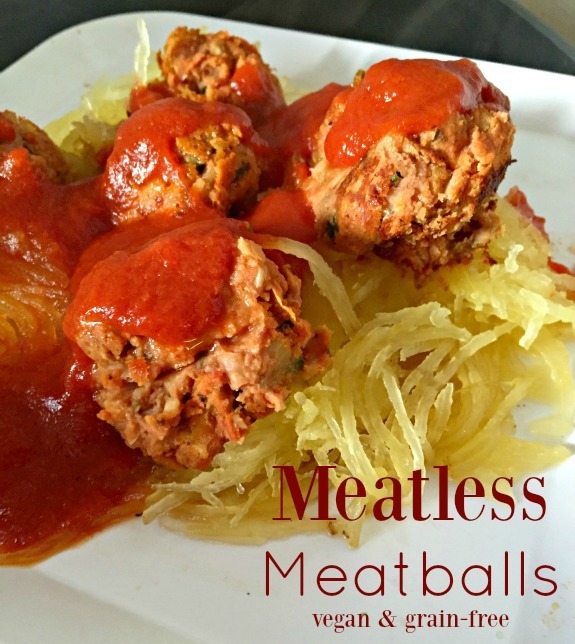 They were a great meatless option for the freezer, easy to heat up for dinner when I felt like a real meatball. But see, then I started to learn more about processed faux-meat products and the questionable health issues that may or may not surround soy (especially processed soy), so I slowly started to phase them out of my diet. Would anything happen if I ate them on occasion? Highly doubtful. However, if I can easily make my own meatless meatballs and freeze a batch for quick weeknight dinners, I solve the whole issue in question. If you don’t have nutritional yeast, you can sub with parmesan cheese but you will be missing out on the health benefits. I like to bake my meatless meatballs in a mini muffin pan. You certainly don’t have to do so, but I find it helps them to bake into the right little shape and then when you remove them from the mini muffin pan, you can further roll them into perfect meatball. These meatless meatballs are easy to make, vegan and grain-free! With just a few ingredients, they come together easily and pair well with pasta or spaghetti squash, giving you the comforting feeling of spaghetti and meatballs, without the meat. Add nutritional yeast, tomato paste and spices, mixing well until combined. If mixture seems too wet, add another tablespoon of nutritional yeast. Fill lightly greased mini muffin pan with mixture or roll into small balls and bake on a greased cookie sheet for 25 minutes. If using mini muffin pan, remove meatballs from pan and roll into balls to set the shape. Serve with pasta or spaghetti squash and smother in your favorite sauce. Store left over meatballs in airtight container in the refrigerator or freeze for later use. Favorite type of pasta (spaghetti, linguine, rigatoni….)? Do you make your own tomato sauce? Love how easy these look – amazing! Yum, these look so delicious, especially with the addition of nutritional yeast. I agree so much about making meatless alternatives at home – all that soy in store-bought ones is not good! I really like nutritional yeast, it works well in this recipe. Oh my, these look delicious and they’ll be perfect for my search for grain free, dairy free make ahead meal options. 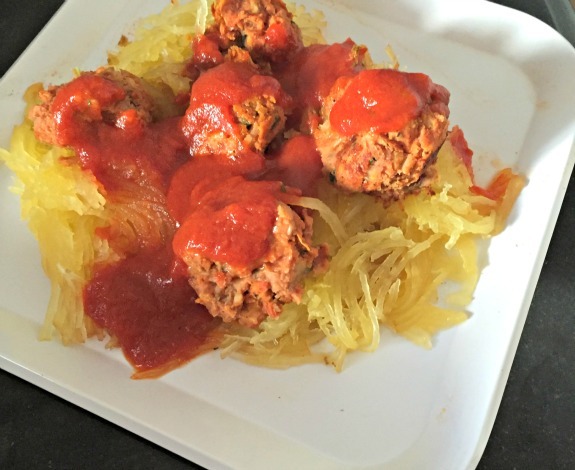 Spaghetti squash and vegan/grain free meatballs? Sounds like a plan for this weekend to me. Definitely perfect for the make ahead dinner options and I stuck a bunch in the freezer too. I would have never guessed that theses were made with beans! And love the idea of adding nutritional yeast. I think it’s a good idea to make meat alternatives at home, because that store-bought stuff can be a little shady. Amanda @ .running with spoons. recently posted…. baked egg stuffed sweet potatoes . They don’t look like beans are involved, right? I impressed myself appearance-wise too. Wow, what an easy recipe for meatballs. 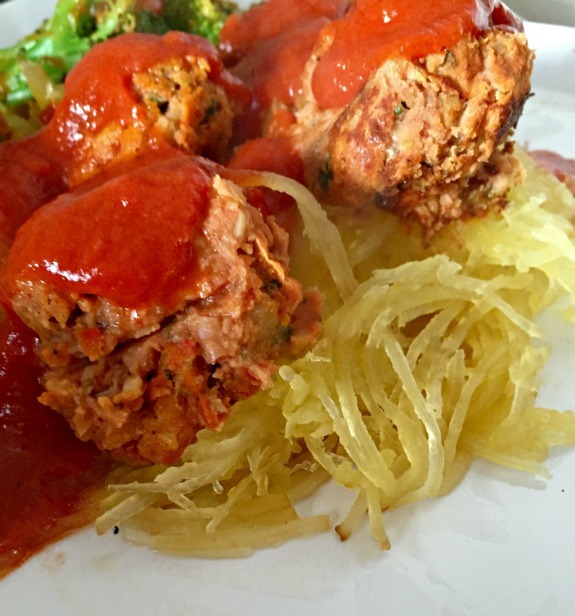 I had salad for dinner last night but made ground turkey meatballs with spaghetti squash last week. Love it! Really easy recipe! Great with spaghetti squash. This sounds delicious! I was worried when I read the ingredients that I would need a food process (don’t have one and need one desperately! ), but I’m happy to see that one isn’t needed. I am happy I didn’t need one either – I like things easy, with as few ingredients and kitchen gadgets as possible! I love that you didnt use any type of grain or oat in these! They look awesome. I didn’t think they would need the oats, and I was right! I really liked them. OHHHH I am so glad you liked them! I love them and they are TERRIFIC as leftovers, great for freezing and reheating really quickly. Hey there are nutritional benefits to parmesan too! 😉 You know I love my cheese. These sound so super easy and I love that they’re made with a few simple ingredients. Great recipe.